Family heirlooms and jewellery are often passed down through generations, being recycled as the family tree grows. Whether it is a shiny diamond ring from Grandma’s collection or a proud set of golf clubs from Great Uncle Ron, family heirlooms and jewellery are often reused and re-celebrated. But what is passed down through generations similar to that of jewellery and memorabilia, that could potentially be far more valuable and important? Why the family’s secret cleaning tips and tricks of course! Who wants an old diamond ring or dusty golf clubs when you’ve got a grime-covered stove or mouldy shower screen that needs some attention? Luckily for you, there are always cleaning tips which circulate through generations, gathering speed and memento as they go. Mouldy shower head? Let it soak in a Ziploc bag full of vinegar. Scratches on your kitchen plates? Rub some baking soda on them. Dark stains on your cutting board? Soak it in lemon juice. Only these fool-proof methods are passed down from generation to generation. However, it seems as though with every home remedy our grandparents pass down, nowadays we have an alternative cleaning product which will achieve the same affect. So why create new cleaning products such as Easy Off Bam and Dettol Mould Remover when our home remedies give us the same results? Why have our cleaning products evolved over time? Two reasons: ease and time-efficiency. Back in the late 1800’s and early 1900’s, western society looked very different than it does today. Men went to work and most women stayed home. Husbands and fathers would earn a living to remain financially stable, and the women would stay at home, cooking, cleaning and raising their family. 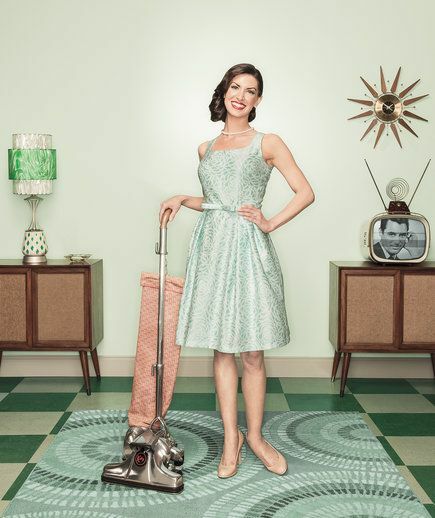 According to the American Cleaning Institute, ‘cleaning products in the early 1900’s were kept traditional and simple as most women had the means to spend a lot of time cleaning their homes and appliances’ (American Cleaning Institute, 2019). However, this all changed in 1914 when WWI broke out. The outbreak of WWI caused an immediate change in western society. The men left to fight the war and the women stayed home, looking after their families. But with all the men away fighting, who would operate the factories and run the everyday lives for the people left behind? This was a huge leap for women in this era as they were finally allowed to step out of the shadows and enter the workforce. Large numbers of women were recruited into the jobs vacated by the men who had left to fight. Cleaning the households was not a priority for these women anymore. And alas, this is where modern-day cleaning products were fashioned. Cleaning product companies identified this shift in their consumers and knew they needed to evolve their products. What their customers needed were easy-to-use cleaning products which were time-efficient. They did not have the means to clean as they were out in the workforce, therefore needed products which were easy and would work fast. From 1914 – 1918, which was the entire period of WWI, over 300 new cleaning products were created and introduced to a new era of consumers (Keilien, 2019). Since then, the repertoire of cleaning products has greatly expanded and evolved, but the underlying purposes have stayed the same: ease and time-efficiency. So yes, of course we want to hear Grandma’s theory on how to clean a grimy oven, and the home remedy to polish Uncle Ron’s golf clubs to the point of shiniest of shine. However, times have changed and we as a race are simply busy. With our busy work and social schedules, we need a cleaning product that is easy to use and time-efficient. Therefore, yes, we want to hear the secret family remedy to cleaning the mouldy shower screen, but will we use that remedy? No, probably not – where’s the old faithful Dettol Mould Remover? It is interesting to look back and witness the evolution of cleaning. From washing your clothes in a nearby river with a metal washboard, to hiring out a professional company to clean any space required, it really is one small step for man and one giant leap for cleaning-kind. Home cleaning remedies are often passed down from generation to generation. Should you stray away from your cleaning products to try Grandma’s secret cleaning tricks? Follow us on the journey of cleaning products and how they evolved over the past 100 years!